Best Cat Trees For Multiple Cats: Need A Jumping Gym or Got HEIGHT? Best Cat Trees For Multiple Cats: Need A Jumping Gym Or A High Place To Sleep? Your cats are part of your family, so of course, you want them to enjoy your home with you. But cats like to have a place of their own too… a place where they can simply be the little lions that they are. Our 4 cats love this tree. Each one has it’s own space (level) to perch and watch everything that’s going on. A cat tree gives them the perfect place where they can be on their own when they want to be. The one I mentioned at the beginning, the one I currently have. You can read more about the company here. Cool thing, this condo comes pre-assembled and ships free from Walmart. Solid wood construction – resists tons of abuse. Five levels, staggered so cats can leap from one to the next. – awesome for multiple cats. Pre-assembled. – No handyman required (but mad heavy if moving it upstairs). Covered with plush household-grade carpet. – simple and easy to clean. Overall size is larger than many, providing solid play space for large cats. The relatively square, vertical shape would fit into most rooms, even small ones. Just be aware of your ceiling height. From the view of a cat, this cat tree is quite simple. Remember that cats like complexity and variety. My overall score, for my living situation, was +18. …is a bit more interesting. This one has “things to do” and “places to see” type set up. See more pictures of this one over at Walmart! An interesting/fun layout: residence, multiple levels, dangling toy, and three perches. Constructed of lightweight materials, not hardwood. – it will feel flimsy and thin but a great start for kittens and small cats… but once they get bigger, these types of activity cat trees will wobble around when your cat launches off of it! Large cats may find this tree to be unstable. – like I said above! Covered with honey-colored Fau by Fur with posts wrapped in thick sisal rope. 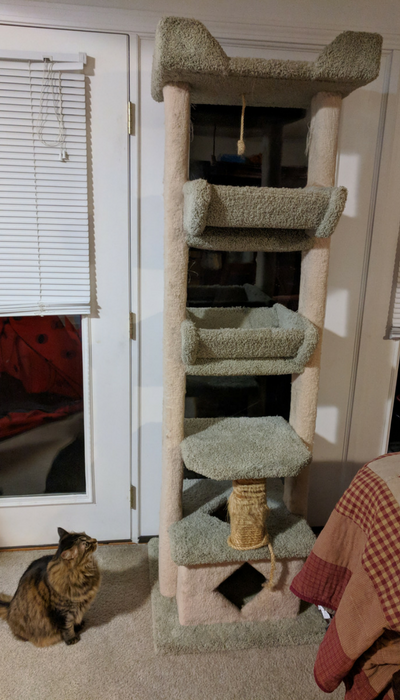 If you don’t have a very large cat and don’t need the underlying structure to last into the next century, this tree might be for you (and your cat). It’s covered with durable and cat-friendly materials, so there’s no need to gamble that it will arrive covered in ugly pea-green-and-red carpet. ugh! So my overall score was +21. 3. This Go Pet Cat Tree Is A Beast! All sorts of fun and interesting distractions! Perfect for kittens or adult cats that love to play! Constructed mostly of pressed wood, the durability is much better than cardboard. Coverings are high-quality natural sisal rope and Fau by Fur; there’s no guessing about color or durability. Stability is enhanced by using a single, large board for its base. Even larger cats won’t topple it. Assembly is required. It comes in 2 boxes, but assembly is fairly straight-forward and easy. If you have space for this monster playground, by all means, get this tree for your little monsters! Many owners report that this is the first cat tree that has held their cats’ attention long-term. It’s big enough, with many caves, tunnels, stairs – you name it – for multiple cats to enjoy it together. There are many places for a cat to hide and sleep, and stable enough for a 25 pounder to jump off of without fear of toppling. If climbing toddlers are a possibility, you may want to attach it to a wall. This tree checked all of my boxes and very few negatives. I gave it an overall score of +28. You can check out my design here with video! I thought I would mention it here because it’s so different and just looks fun. Plus if you don’t have a ton of space this a great choice. Wall-mounted, this ‘Playplace’ takes very little space but provides several fun elements to keep cats coming back for more. Engineered to hold the heaviest of cats, this is constructed of solid wood and heavy canvas. Assembly is required. – you know, like mounting it to the wall. I’m guessing that you’ll need a drill, “lead anchors” or “plastic anchors” with screws and some elbow grease. If you value artistic, clever, innovative conversation starters, and have very little floor space for a cat tree, this one’s for you! Despite its minimalist appearance, there are stairs, hammocks, a cat ladder, and a hole to explore. It’s easy to install with screws and a stud finder looks like a piece of wall art and is constructed of very strong material to accommodate the heaviest cat. For me, the negatives included a lack of scratch posts (although you can create your own), enclosures like caves or tubes, and not enough room for more than 2 cats at a time. But your situation is probably not the same as mine. I gave this very unique, solid, and esthetically beautiful tree an overall score of +16. Find A Way To Entertain Your Cat! First, they have to be interesting. All cats like complexity. They enjoy a variety of physical and mental challenges, especially the young ones. If you watch them play, they will run, switch back, jump across a chasm, climb a pole, zoom this way and that, hide, spring out to surprise, and on and on. Multiple levels and high perches encourage them to run, climb, and jump. Hiding places are also important so that they can curl up and sleep, or lay in wait to spring an ambush. Cats love caves and tubes so they can secretly watch the rest of us. Scratching posts are very popular with cats and their humans. They can save your furniture, and double as climbing posts. Bouncy toys and bridges that sway are fun because they change positions, and cats love to calculate new trajectories on-the-fly. Finally, little holes here and there make for excellent mouse-hole simulations. All of this cat dream goodness must be wrapped in carpet or other soft, springy coverings that feel good under their little feet, let them dig in, or sleep in warmth and comfort. That said, not every cat is the same as every other. Some cats might zoom up and down several times a day, while others prefer to sleep and watch, staying above it all. Some just like medium heights, while a precious few prefer ground level. 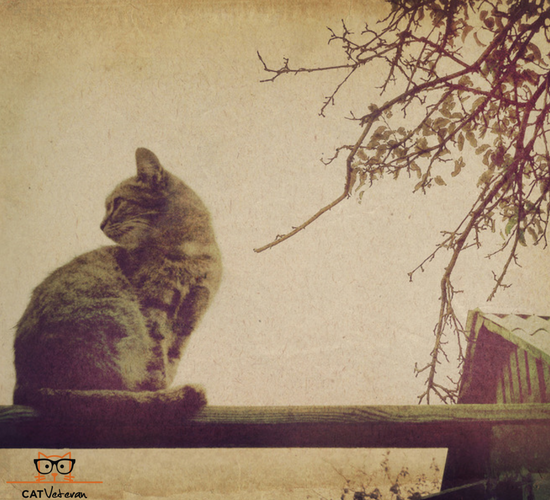 Should you take into account your cat’s preferences? 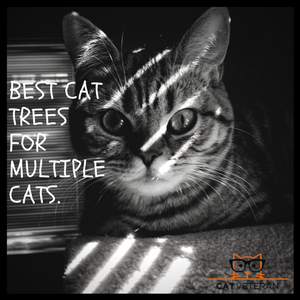 While you can try to find a tree that fits your cat’s habits, don’t be surprised if new opportunities trigger new behaviors. After all, if you were going to a waterpark, you might try a water slide, even though you don’t have one at home. So, even if you can’t imagine your cat doing anything but sleep at the top level, it’s better to give him more choices than too few. He might just surprise you! What Are Cat Trees Made Of? A more practical concern is durability. Anything that claims to withstand a tornado of claws and teeth must either be very, very tough, or naïve. Some cat trees have a base structure of soft wood, particle board, or even cardboard, which doesn’t stand up to repeated cat attacks. Hardwood or OSB (Oriented Strand Board) makes them strong enough to withstand your little lion’s fiercest play. The covering can also either be cheap or tough. Some trees are covered with whatever carpet is handy at the time, while others use quality material designed for durability. 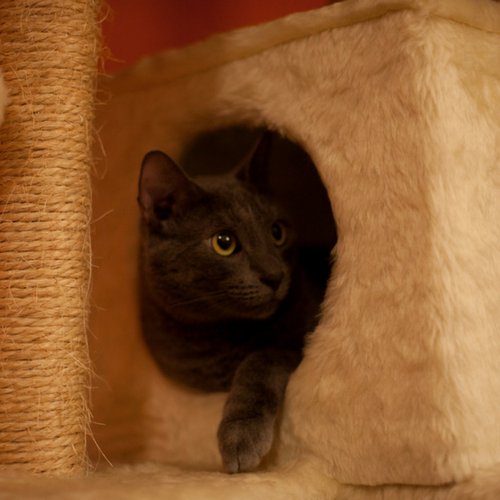 The type of carpet used on cat trees can always vary… especially if you make your own. Although a plush carpet might look warm, soft and comfortable, don’t be fooled; many coverings can be shredded in seconds. Look for coverings that are specifically made to withstand ferocious felines. For example, Fau by Fur is a popular, durable, yet comfortable covering used in many well-made trees and its neutral beige usually works well in most rooms. If the covering is carpet, at least demand tight-weave nylon with built-in stain resistance. Also, take into consideration the thickness of the carpet. Might be hard to bend and staple to the wood when building. Berber carpet is probably the worst since it’s easily ripped to shreds. The same goes for the sisal rope that is often used to cover poles; cats love to scratch and rub themselves against them, so heavy-duty, braided sisal is the very best. It just makes sense that your cat would want something similar to bark. Here is a great DIY for a tree branch cat condo. Sisal rope comes close because it’s made from a cactus-like tree. Cats love it because they can dig their claws deep into it and pull hard! Its rough texture also feels great under their paws (something like a luffa back scratcher for humans). The bigger your cat, the stronger these tree substitutes need to be. After all, when they are pulling down hard, they are exercising and getting even stronger! Jute rope is another favorite, but it’s not nearly as rough or as durable. How the tree is constructed is as important as what it’s made out of. Carpet coverings should be stapled, not glued. You can super glue the carpeting after stapling if you have places that perk up… like corners or sides. Ropes must be firmly attached, preferably with both glue and staples. Be certain that all surfaces have been covered, including the insides of caves and hiding nooks, as well as the bottoms of perches, tunnels, and bridges. To be honest, this is a great video BUT unless you don’t have all these tools, supplies and know how… I guess I would say it would be cheaper and less of a headache to just go buy one. Yet, for all you DIY’ers, this is a great project to tackle! Finally, ask yourself how the tree would fulfill your other needs and expectations. Is the size right for the available space and cat population? How stable is it if you have an extra-large cat, or if a child decides to climb it? Do its shape and color fit in with the rest of the room? All of these concerns (and more) are legitimate and depend on your particular situation. Using the pointers in the sections above, let’s take a look at some popular cat trees to see how they stack up. Tip: circle the things that matter to you (either plus or minus), then go back and give each circled item a score from -5 to +5. Finally, score anything that isn’t listed but feels important to you. Add up the scores to get an overall score for each tree. But before you take the plunge, try to imagine what might happen the first time your cat lays eyes on his new wild habitat simulator (cat tree). Will it be love at first sight? Maybe, but don’t be surprised if you have to teach him to love it. After all, kittens are taught by their mommas how to hunt, and this isn’t that much different. Here are some tips to help you, and your cat, through this first play date! First, make sure that you put the new tree someplace comfortable and familiar. Next to a sofa that he sleeps on would be good, but not in a room that he rarely visits. If he’s already used to resting and playing nearby, he’s probably going to accept the tree with no problems. This might be obvious, but make sure there are no “stressors”, such as a running vacuum, unfamiliar person, or arguing neighbors. Once he’s on the tree, reward him with petting and treats. Play with him and place his favorite catnip-filled toy where he can find it. In fact, getting fresh catnip ready for the big day is a great idea! Sprinkle a little on the tree and watch him go crazy. Entice him to visit all of the tree’s spaces with more catnip or new toys that can be placed around. For the next few days, give him at least 10 minutes of attention while he’s on the tree. He’ll quickly associate it with you and good feelings! In this contest, for me, there was no contest! The Go Pet Club cat tree outscored all comers by a mile. Even though I still love my new cat condo! Recently though, I’m more leaning towards the wall-mounted cat furniture for space and it seems more fun for my cats. If you live in an apartment this may not be an option but you can surely ask! But the purpose of these reviews is to help each individual choose the best tree for their (your) particular situation and cat population. Enjoy your cats as they enjoy their new home within your home!